We offer FREE cleaning and inspection to all jewelry. We highly recommend having your jewelry cleaned and checked every 3 months. 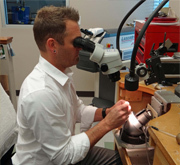 By letting our professionals inspect and clean your jewelry, you are avoiding the risk of potential problems you may have with your jewelry. Jewelry is often worn every day, much more than any other item of clothing. Over time, the daily exposure can begin to wear on the prongs that hold the stones secure. It never hurts to just drop by and let us check your pieces for you. Who doesn’t want secure and beautiful jewelry? We offer cleaning cards that you will receive when you bring your jewelry in to be cleaned and checked. After 6 times of bringing your card in and getting it marked, you will receive 10% off your next purchase.